The Lounge Quintet (aka The Fretless Five) formed in 2005 after a serendipitous meeting between singer/choir director Stuart Davis and cellist/Sydney Chamber Orchestra director Guy Curd. The band quickly established a great rapport and a common vision – to play their own arrangements of original and classic pop songs in a traditional string quartet + voice format. Inspired in part by the wonderful collaboration of Elvis Costello with The Brodsky Quartet, the group has found a niche combining the highly elaborate songs of early David Bowie and recent Rufus Wainwright, with the character-driven songs of Elvis Costello and singer Stuart Davis. Another strong influence is the Cuban ‘son’ music made popular by the Buena Vista Social Club. Arrangements are mainly by Stuart, but some material comes from local musicians Tony Backhouse and Jackie Orszaczky. Tony's arrangement of 'Born To Be Wild' is completely insane. 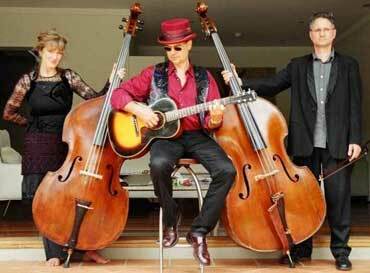 Also performing on the night is Urban Excentrics, a diverse fusion of jazz, folk, classical and contemporary sounds produced by tantalising double basses, dancing mandolin, banjo and citern with driving rhythm guitar & solos. Free car parking: Gordon Street church car park. The Lounge Quintet aka "The Fretless Five"